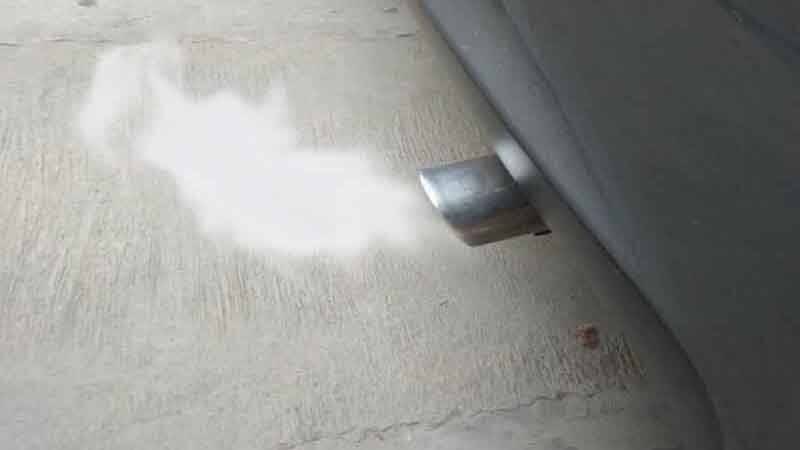 It is normal for exhaust fumes to be released through your vehicle’s tailpipe. In most circumstances, these will be clear fumes that you cannot see with the naked eye. The only exception is when it is cold outside, and the fumes look white. This is merely a reaction that happens when the exhaust first encounters the outside cold air after you start your vehicle. The whiteness should clear up after a few minutes. However, if you see thick whiteness that keeps coming out of your exhaust system, this is white smoke rather than merely white exhaust fumes. White smoke is a sign of trouble. The only way to resolve the white smoke problem coming from your exhaust system is to fix the root cause of the problem. To do this, you need to consider all the possible reasons as to why white smoke would form in the exhaust. Then you will inspect your vehicle and investigate the possible causes for yourself. If you are not familiar with auto mechanical work, then have a professional do the investigation for you. Below are the top 6 causes of a car blowing white smoke from the exhaust system. 1) Oil Leak – If your valve seals or piston rings were to ever leak oil, then your fuel could be contaminated in the internal combustion chamber. A combination of oil and fuel during the combustion process will result in white smoke to generate in the exhaust system. Sometimes it will even be blue smoke. What’s worse is your engine won’t have enough oil to lubricate and cool down its components. As a result, engine problems will soon follow. 2) Cylinder Head Crack – Coolant may leak out of your cylinder head if it has a crack in it. This crack can happen if the cylinder head was damaged in any way. Even the smallest crack can result in coolant leakage. If the coolant were to leak into the engine oil and get mixed together, it will cause oil contamination. Even though oil and coolant both work to cool the engine, they cannot be mixed together. If they are, it can cause white smoke to emit from your tailpipe. A foul odor may even form in the cabin too. 3) Faulty Fuel Injector – If your fuel pump injectors are not giving fuel to the engine at the appropriate times, it may result in white smoke after the combustion has been initiated. This typically happens more with diesel engines than gasoline engines. In any event, you’ll want to fix this problem because it will ruin your fuel economy too. 4) Engine Block Crack – A crack in your engine block is a nightmare scenario. If you have this problem along with white smoke coming out of your tailpipe, there are several reasons as to why the white smoke is being produced. You will need a licensed auto mechanic to investigate the problem because any issues with the engine are going to be costly and complex to deal with. 5) Coolant Reservoir Tank Leak – Coolant can also leak out of the coolant reservoir tank where it is stored. Although the reservoir tank does not generally leak on its own, it may leak if something caused damage to the tank. Perhaps someone was working on the vehicle and inadvertently damaged the tank. Whatever caused the damage, you’ll need to replace your entire tank if it has the slightest crack in it. 6) Engine Control Unit Malfunction – The engine control unit controls the fuel pump injector, among other things. You may have a situation where your fuel pump injector is working properly, but still not injecting fuel into the engine at the right times. The reason for this could be that your engine control unit is malfunctioning instead. This will cause white smoke as well.